We know how much weight our African-American Studies Department holds now, but what did it take to get there? Racial tensions were already shaky on Georgia State’s campus back in 1992, after the infamous Rodney King case, but it was a trash can that pushed student activists to their breaking point. On Wednesday, Nov. 5, 1992, brothers from Phi Beta Sigma, a historically black fraternity, found a trash can that had “[N-word]s enter” stenciled on the top, and even had the racial slur misspelled. The trash can was used for their fraternity’s open house earlier that day. Enraged, but more importantly, impassioned, the Phi Beta Sigma brothers, including a notable Eric Bridges, took the trash can around campus to alert student activist groups of the egregious offense. Students felt that the administration was consistently passive with attacks on black student groups. “Everything is done subliminally,” Phi Beta Sigma treasurer at the time, Arpell Pearson, said. One student even claimed that the then Dean of Student Life H. King Buttermore wasn’t “repulsed” by the act as he claimed, he was just “pissed off” that he had to deal with the mess. The following Friday, Kenyatta Adeniya, president of the Black Student Alliance, along with Lawrence Phillpot, student leader, voiced their grievances directly to President Carl V. Patton, who personally denounced the incident. Another fraternity, Sigma Nu, eventually identified one of their members as the offender, suspended him, and openly condemned the act, but students weren’t going to settle for that. They gave President Patton a list of 11 demands the student activist leaders made to the university that they expected to be implemented by the following Friday of the original incident. And before the allotted time even came, students occupied the first floor of Sparks Hall around 7 a.m. the Monday after the demands were presented. Another protest led by the Alliance of Lesbian, Gay, and Bisexual Students (ALGBS) first occupied the school cafeteria, and then the first floor of the general classroom building (now Langdale Hall), cutting off elevator access. After the student activists’ unwavering persistence throughout the day, President Patton eventually came to an agreement with the students late that same Monday to comply with seven of their demands. The agreement included that participants would not be punished for their activism, suspension of two fraternities for at least three years, a racism/sexism hotline, investigation of the dean of students division, the policy that Georgia State must inform students of all administrative decisions, and lastly, the formation of an African American Studies Department by fall of 1993. 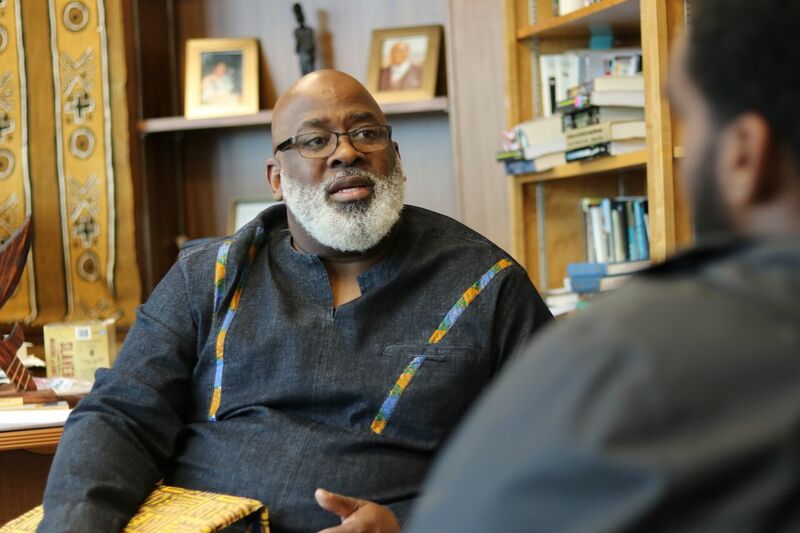 Dr. Akinyele Umoja, chair of the African American Studies Department, sat down with The Signal to give his input on the history of the department. Umoja first came to the department as the fourth faculty member in 1996, but was still teaching at Morehouse College during the sit-ins. Umoja said it was the undying student and community support and participation in the sit-in that brought around the results they were hoping for. “It was a Metro Atlanta affair, if you will,” Umoja said. Students from Spelman, Morehouse, Clark Atlanta, as well as community leaders such as Joseph Lowery, the president of the Southern Christian Leadership Conference at the time backed Georgia State students at the sit-ins. Umoja also explained that Georgia State had a lot of nontraditional students then like Phillpot who had served in the armed forces. The experience of older students helped to organize and execute the protest safely with the experience they had dealing with “the system” beforehand. While today, our black student population has increased to more than 40 percent, diversity still lacks within faculty and staff. As a department chair, Umoja said he is often times the only black person at some meetings he attends. “I think that’s a great challenge for us as we move forward, for people to know that that shouldn’t be the norm,” he said. But he also said that everyone on campus to can help shape what that “norm” should be, and how we can positively embrace diversity. After being informed of the recent withdrawal of former Georgia State soccer player Natalia Martinez, who used the N-word on her Finsta, Umoja thought it may have been more valuable to her and our community if she stayed and we openly discussed how to handle and prevent situations like that on our campus. “I think there’s a space for sanctioning a person, but also attempting to educate them,” he said. Umoja made it clear: dialogue is essential for growth on a college campus, as opposed to cutting the student off. “We need to engage in some sort of process where we know how to behave with each other,” he said. He believes students should have the experience of seeing how their words can affect other people, and to act accordingly to that. “Sometimes I might change how I behave because I don’t want to hurt people just because I want to express my point of view,” he said explaining his personal experience with the idea. While there are still challenges ahead of the African American Studies Department at Georgia State, the progress is undeniable. They have grown to have more than 60 student majors, 100 student minors, and close to 30 graduate students, which is great for a department with only 7 faculty supported by the staff. Their faculty have produced books and award-winning documentaries, and more to contribute greatly to the field African American Studies. “Our vision is to move even further,”Umoja said. Umoja also pointed out that while the program is great for learning about one’s history, their goal is also to produce employable alumni. With graduates in the field of cancer research, investigative reporting, academia, and more, the proof is in the pudding. “Students, we feel, sacrificed to create this department, so we feel like we should be committed to excellence,” he said. He went on to say, “It’s a part of our mission to embrace the area of social justice in our academic life and in terms of our social responsibility,” referring to those students who sacrificed for the program.